Wow! Wouldn't it be great to see 3,000 added to God's people in church today. Those who accepted Peter's message at Pentecost were baptized and the beginning of the early church started with an incredible bang. Earlier that day, only a small group of Jesus' followers had met to pray just as they had done for several days since Jesus' ascension. As night falls in Jerusalem, the number has jumped to over 3,000! 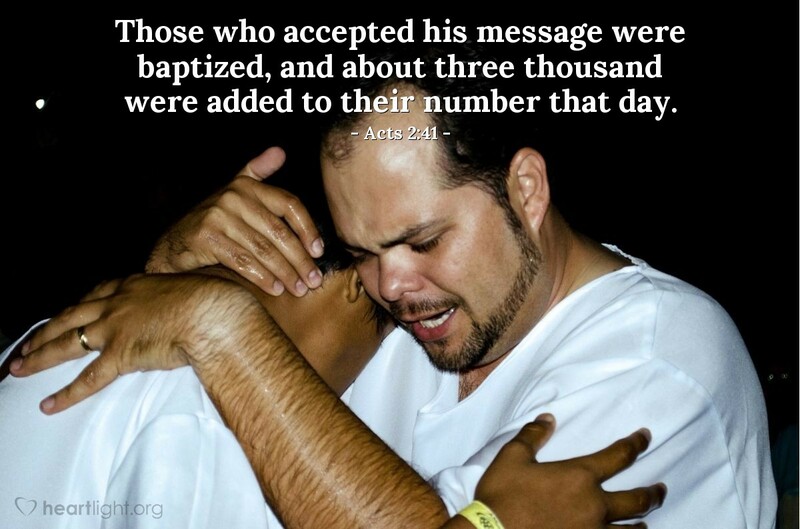 Acts 2 stands as a hallmark passage showing us the message of salvation, what the response of open hearts will be, and how the Holy Spirit uses this simple message to bring seeking hearts to salvation and community. Why don't you read Acts 2 today? Jot down what Peter says about Jesus. Notice what Peter tells the people to do to be saved. The Gospel is still just as simple, so let's not only study it; let's share it, praying for God to bring revival to our times and to our broken land! Holy and Most High God, please breathe your Holy Spirit out upon us and bring true revival today to our churches and salvation for thousands who are lost. I pray this, in Jesus' name. Amen.